A unique partnership between the producers of the long-running hit TV series Power Rangers and Auckland’s economic growth agency has created an exciting opportunity for talented students to learn first-hand what it takes to work in the region’s thriving screen industry. Power Rangers has been filmed in Auckland since 2002, creating jobs and a significant boost to the regional economy. Power Rangers is seen in more than 150 markets, translated into numerous languages and is a favourite on many key international children’s programming blocks around the world. Fifteen seasons to date of the series have been shot in Auckland, with all based at Studio West – a privately owned facility in the industry’s west Auckland heartland. In the past three seasons, Power Rangers Productions has worked with more than 1000 Auckland vendors – spending more than $100m; in that time, it has contracted more than 1800 on its crew, paying wages of more than $43m. Jack Mensah, who has now graduated with a Bachelor of Digital Design from Auckland University of Technology (AUT), completed a four-week placement. The long-time fan of Power Rangers says: “It was thrilling to have the opportunity to peek behind the curtain, and to gain practical industry knowledge while being part of something so internationally recognised. “It fulfilled a lifelong dream to work with experts at a professional film studio, and I got to work with some of the most genuine people I've ever met. As a student on the verge of graduation, being involved with this traineeship really gave me an extra burst of ambition – knowing just what's out there and available after university,” says Jack. He learned a wide range of fabrication tips and tricks, and how to fit into a production pipeline efficiently; as well as insights into how film and television production works as a whole. “Only a traineeship like this could provide the practical exposure I got. Having made great connections, so many opportunities are now simply a phone call or email away. Those personal connections are so important with this industry”. Students from AUT, SAE, and Unitec are involved in the programme to help produce the type of skilled workers the industry needs and to continue to attract talent to the industry – which often finds it hard to fill vacancies for highly skilled positions. The trainee placements are being followed by five workshops where experts from Power Rangers Productions will explain crucial aspects of the main elements of screen production including Production/Locations/Health & Safety, Camera/Lighting/Grip, Art Department, Directing & Assistant Directors and Post Production. 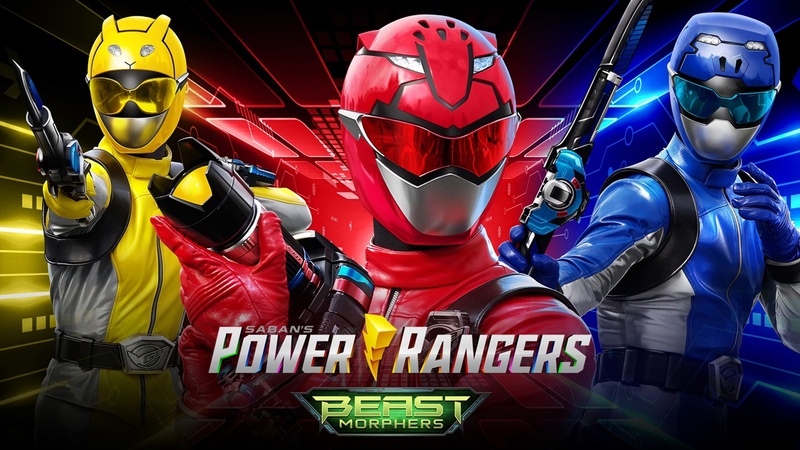 ATEED’s partnership with Power Rangers Productions is for production in 2018 and 2019 for Power Rangers Beast Morphers, which will screen in 2019/2020. Pam Ford, General Manager Economic Development at ATEED, says the screen production and post-production sector in Auckland earned more than $1.1 billion a year in gross revenue last year, and the wider screen sector supports more than 7400 jobs. Auckland is by far New Zealand’s dominant region for television production and post production, with $420 million gross revenue in 2017 – 84 per cent of the national total. “Power Rangers has been a significant and valued contributor to our region’s growing screen industry for the best part of two decades. For us to continue to attract productions such as Power Rangers to our region, we need to keep producing and retaining the skilled talent to work on them,” says Pam Ford. “We are delighted that Power Rangers Productions agreed to partner us on the programme, because the kind of experience the students will gain is so valuable. It is unprecedented access to real world professionals and production,” says Pam Ford. Chip Lynn, Executive Producer, Power Rangers Productions says: “We are proud to produce Power Rangers in Auckland; the brand would not be the powerhouse entertainment franchise it is today without the region’s gorgeous scenery and the skilled and experienced crew members who bring the show to life for audiences around the world. “As we continue production for the 2019/2020 season of Power Rangers Beast Morphers, we’re excited to open our doors and collaborate with ATEED on this unique programme to give students the opportunity to learn key elements of TV production first-hand from our Power Rangers Productions team. Power Rangers – which usually shoots with a main unit and a stunt unit when on location – is a familiar sight to Aucklanders as it captures outdoor action scenes among the region’s unique locations. For the Power Rangers Ninja Steel 2016/17 season’s shooting alone, the production obtained 53 Council permits from Screen Auckland to film in public spaces. Power Rangers shoots extensively in the region’s west, as well as the central city – transforming urban locations such as Viaduct Harbour, heritage Albert Park, Auckland Museum and Domain, Spark Arena stadium, and Council offices in Henderson and Western Springs, into the dynamic sets required for action scenes. The production regularly makes the most of the huge visual range of Auckland’s beaches which are within easy reach of film studios: from the eastern coast’s calm waters and white sands, to the west coast’s famed black sands and dramatic landscapes. Stunt scenes are set on a range of locations with space and natural drama, including quarries and arenas across the region.